Stories about cops and robbers usually feature -- you guessed it, the robber! In the Great Depression era of the desperado, two women of state law enforcement made their own imprint. They each had problems with their public image. One survived the era with her career intact. The other was forced into early retirement. In the days predating large-scale enrollment of women in policing, there was little upon which to base an opinion. Female police officers generated reactions ranging from the good, the bad, to the ugly -- mostly the bad and the ugly. Take for example these two women of Indiana. Both served their official duties during the zenith of the Midwest Crime Wave, facing the boldest desperadoes of the time. Both of these women stepped into positions that required bravery and a revolutionary, trail-blazing attitude. Fingerprint expert Marie Grott of the Indiana State Police and Sheriff Lillian Holley of Lake County, stood out among the state police of the John Dillinger man-hunting brigade. At the height of the Midwest Crime Wave of 1933-1935, these two women police officers were at ground zero, the matrix of the hunt for Dillinger. It was an interstate, embattled officialdom, a backstabbing place where officials turned on each other, talked behind each other's back, and sold each other out. And those were the men -- Captain Matt Leach of Indiana, Inspector Yendes of Dayton, Chief Michael Morrissey of Indianapolis, to name but a few. 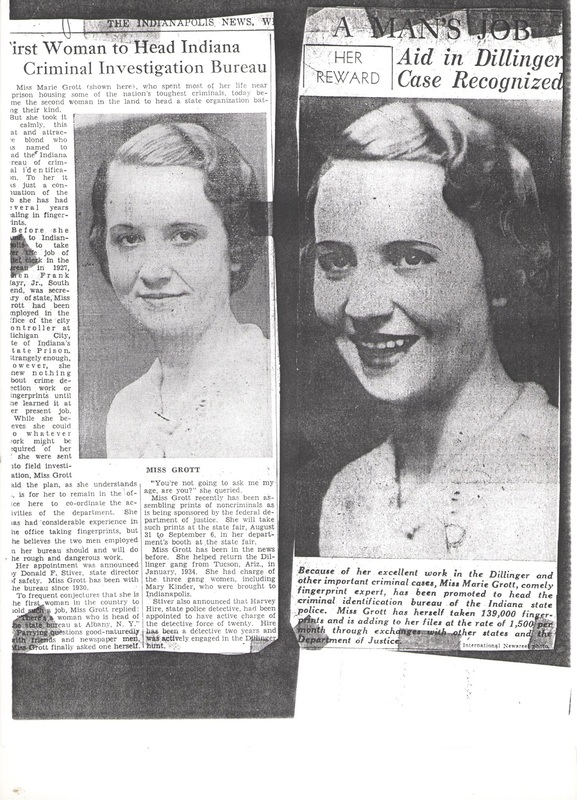 Both Marie Grott and Lillian Holly were maligned in the sexist press in the days before "sexist" was even a thing. Both were hammered and elevated at the same time. The result of this character assassination was more deadly for Holley than for Grott. Grott was a rising star in the department, a fingerprint expert who would soon head the Bureau of Criminal Identification. In Tucson, Grott kept a poker face for photographers. No doubt, the officer was aware that one false move, in this case a smile, would ruin the credibility she was trying to establish in her career. As a result of her intuitive knowledge of the shark tank she inhabited, she survived the era with a strong reputation. Grott managed her high-profile moments carefully, and stayed out of the limelight whenever possible. While Marie Grott was patronized, Lillian Holley was vilified. Holly is remembered as the "lady sheriff" who had charge of the Crown Point facility when Dillinger blazed out with a wooden gun. A year before the escape, Holley had been assigned the job of sheriff after her husband, Roy, died in the line of duty. She would eventually be skewered as holding a job that was "too tough for a woman." Holley was caught in the crossfire of the sensational "wooden gun" Crown Point, Indiana, escape. The press coverage that destroyed her reputation was the result of ignorance on the part of reporters as to the true machinations behind the escape. Add to this a desire to tap into Depression-era America's inability to accept females in policing. While the pundits blamed Holley, the true culprits -- the politicians, prison employees and judicial officials who were involved in the bribery conspiracy -- walked away from the grand jury investigation like a walk in the park. It did not help Holley that she, as the sheriff, was featured next to prosecutor Robert Estill as he posed with his arm around Dillinger. She smiled and appeared to be having a good time. It was a moment that would prove to be her undoing. 5 Shortly after the escape, the press editorialized that Dillinger flew the coop because a women was in charge. Lillian Holley's nephew, Carroll Holley, floated around like Estill's ghost during the period that his aunt was pilloried. Young Holley is photographed numerous times with Estill (in photo above, behind Estill to the left). Young Holley as the deputy sheriff, took over for his aunt shortly after the escape. Somehow, young Holley escaped the tag of holding a job that was too tough for the nephew of the lady sheriff. It seems in hindsight that Lillian Holley took a fall in order to allow the job to remain in her family, that young Holley would be a placeholder to allow the minions of Robert Estill to maintain control in Crown Point/Lake County. Lillian Holley got no support from news reporters who could have added a positive voice. Dillinger-scoop staff writers for the Indianapolis Times, in particular Basil Gallagher and William "Tubby" Toms, did not step up and use the power of their pens to vindicate Holley. While Toms took his material from ISP Captain Matt Leach, Gallagher often wrote independent, expository features. 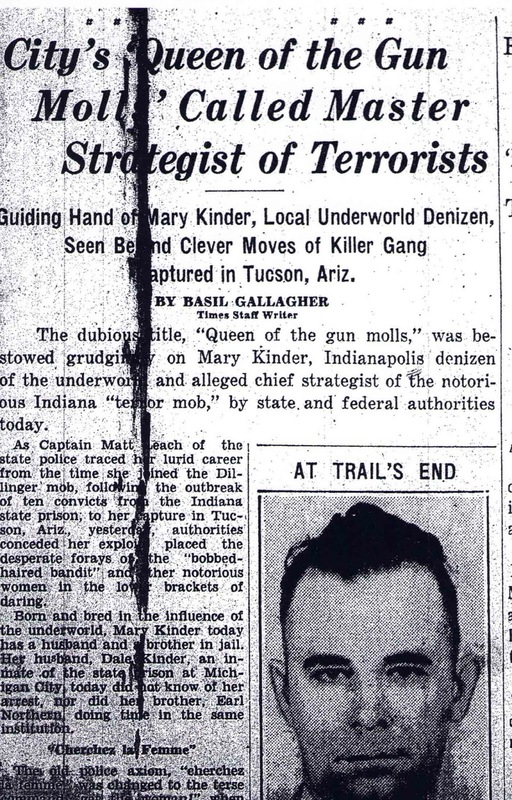 It was Gallagher who first labeled Dillinger gang moll Mary Kinder as the "Queen of the Gun Molls." Had he done research into the background and experience of Lillian Holley, Gallahger would have learned some impressive facts. "Mrs. Lillian Holley" retired from Lake County politics shortly after the escape, and her nephew, Carroll Holley took her place. "Because of her excellent work in the Dillinger and other important criminal cases, Miss Marie Grott, comely fingerprint expert, has been promoted to head the criminal identification bureau pf the Indiana State Police. Miss Grott has herself taken 139,000 fingerprints, and is adding to her files at the rate of 1,500 per month through exchanges with other states and the Department of Justice." 1. Ellen Poulsen and Lori Hyde, Chasing Dillinger: Indiana's Matt Leach Collides with the FBI, McFarland Publications, Exposit Imprint, to be released in 2018. 2. 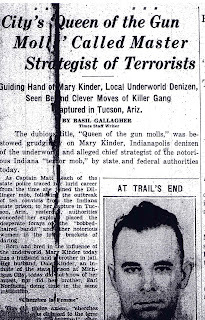 Basil Gallagher, "City's Queen of the Gun Moll Call Master Strategist of Terrorists," Indianapolis Times, February 1934; "Holmes Out as Kinder Counsel," Indianapolis Times, February 3, 1934. 3. Poulsen and Hyde, Chasing Dillinger. 4. 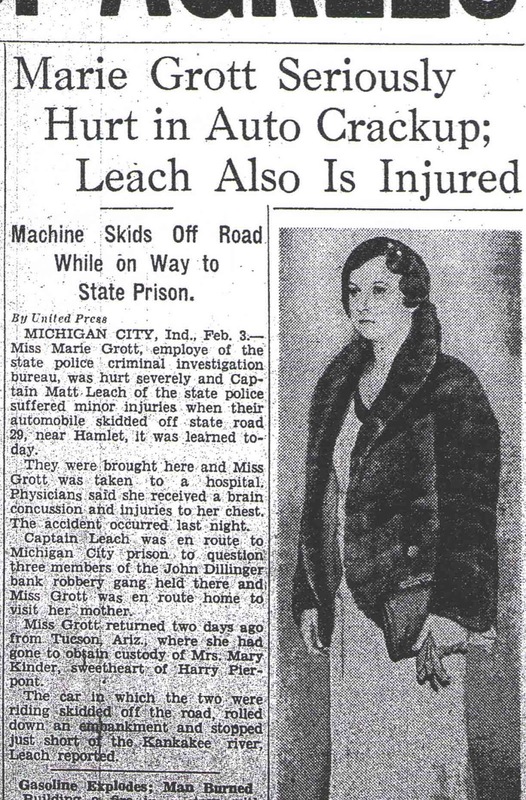 "Marie Grott Seriously Hurt in Auto Crackup; Leach Also is Injured," The Indianapolis News, February 3, 1934. 5. "Indiana Desperado No. 1 Now Lodged in Jail of Mrs. Sheriff Holley," Indianapolis News, Jannuray 31, 193; "Woman Sheriff Unafraid as Killer Joins her Family," misc. news article. 6. Poulsen and Hyde, Chasing Dillinger. 7. John J. Binder, Al Capone's Beer Wars: A Complete History of Organized Crime in Chicago During Prohibition, Prometheus Books, 2017, 96, 97. 8. Ellen Poulsen, Don't Call Us Molls: Women of the John Dillinger Gang, Clinton Cook Publishing Corp., 2002, 140. 9. 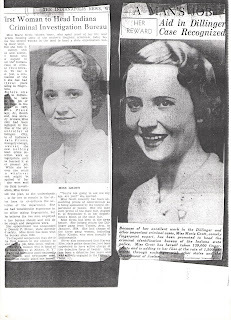 The Indianapolis News, September 14, 1935; "G-Woman in the U.S. Now",:Daily Mirror, September 14, 1935. Ellen Poulsen is the author of Don't Call Us Molls: Women of the John Dillinger Gang; The Case Against Lucky Luciano: New York's Most Sensational Vice Trial; and co-author of the forthcoming Chasing Dillinger: Indiana's Matt Leach Collides with the FBI. She lectures on the 1930s gangster era and has appeared on numerous TV documentaries, including AMC's The Making of the Mob. She has started work on a book examining the 1934 New York State conviction and execution of accused husband "murderess" Anna Antonio.